May | 2012 | News from Notch Consulting, Inc.
Nokian is scheduled to begin production at its new factory in Vsevolozhsk, Russia in June 2012. The factory is built alonside an existing plant. Two new production lines are scheduled to begin this year, with two more to begin production in 2013 and 2014. At that time, the plant’s annual capacity will be six million tires and the two Russian factories will have a combined annual capacity of approximately 17 million tires. As production increases in Russia, Nokian is reducing work at its home factories. Starting in July, production at the tiremaker’s plant in Nokia will be cut back to a five day per week schedule. According to the company, the plant will continue to produce primarily for the Nordic countries. The modified production plan will lead to a cut in outsourced labour and the elimination of around 120 jobs. Nokian says a 30 million euro modernisation plan being carried out in the Nokia factory will enable it to operate with a lower workforce. Rubber demand in China is set to expand 7.2 percent in 2012, beating last year’s pace, as the government focuses on bolstering the world’s second-largest economy, an industry group said. Consumption is forecast to reach 7.4 million metric tons in 2012, up from 6.9 million metric tonnes in 2011 and 6.45 million tons in 2010, said Mary Xu, deputy secretary general of the China Rubber Industry Association, at the World Rubber Summit in Singapore. Of the total, 4 million tons will be the synthetic variety and 3.4 million tons natural rubber, she said. The government is paying, “more attention on the development of the auto industry,” Xu said. 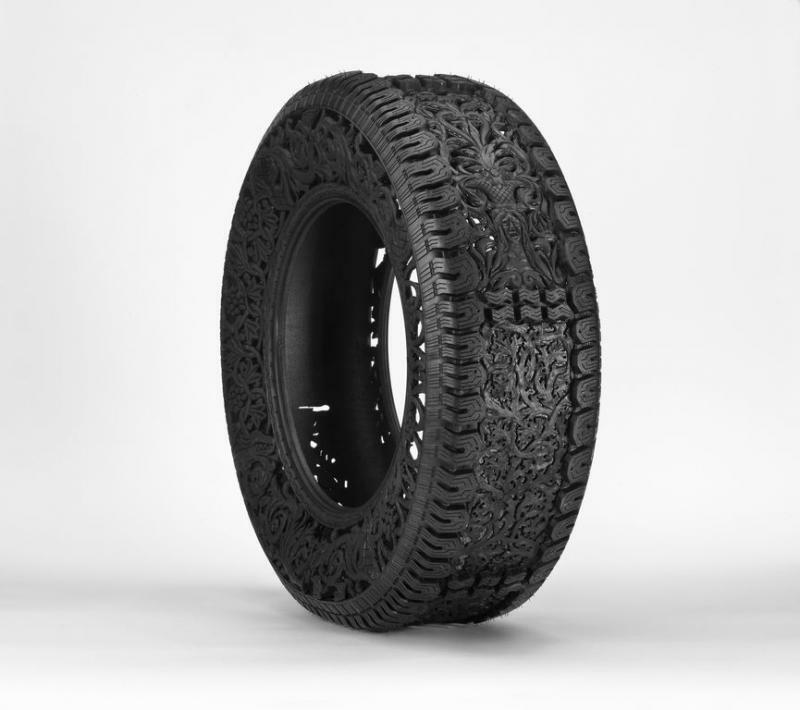 Belgian conceptual artist Wim Delvoye works in a wide range of mediums, one of which is radial car and truck tires. 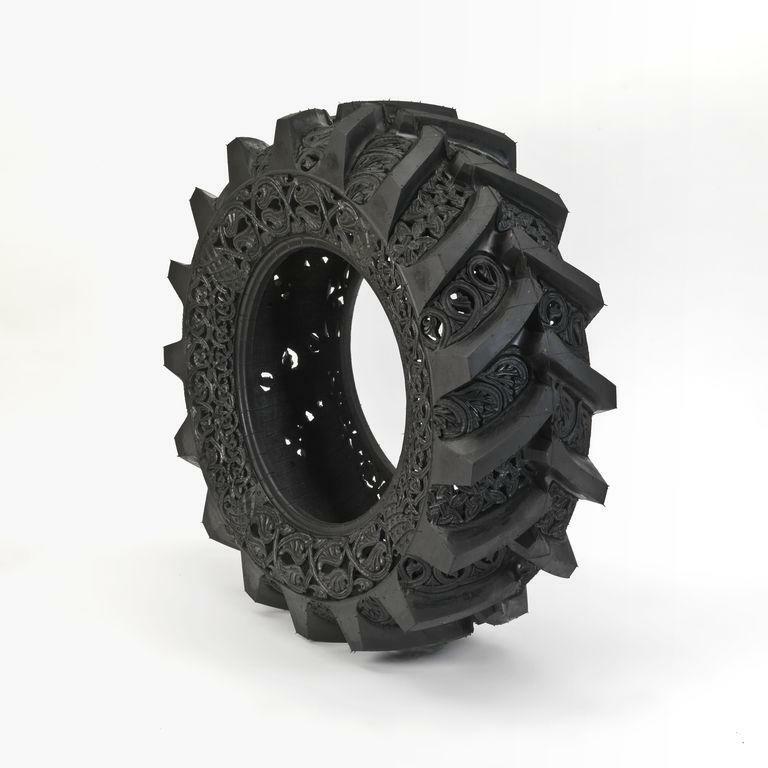 Under Delvoye’s hand, the tires become exquisitely carved works of art. Here is a page that has examples of his work in tires, and here is the artist’s own webpage, which is rather challenging in its own right. On May 15, Oriental Carbon & Chemicals Ltd. of Kolkata, India commissioned the second 5,500 mtpa phase of its 11,000 mtpa expansion project for insoluble sulfur at its facility in the Special Economic Zone (SEZ) at Mundra, Gujarat. The company made the announcement with a brief statement to the BSE. 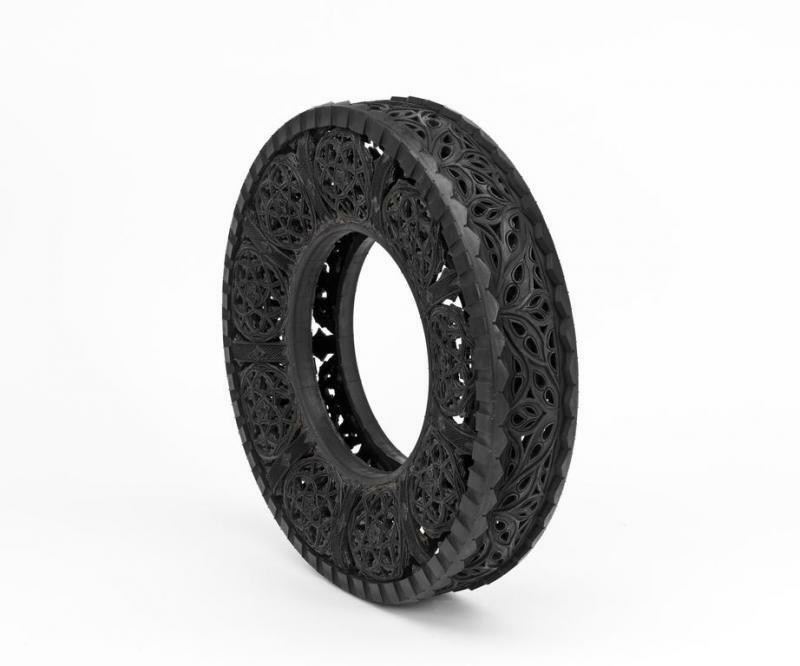 On May 17, Bridgestone announced the launch of its new Run-Flat Technology tire (RFT), the POTENZA S001 RFT, for the replacement market in the Middle East and Africa. The tires will be available beginning this summer in 16 different sizes, ranging from 16 to 19 inch diameters. Run-Flat Technology tires are designed to provide 80 km distance at 80 km per hour speed after deflation. POTENZA S001 RFT tires are the latest generation of Bridgestone’s Run-Flat Technology tires, which were first launched in the early 1980s. — The use of new side-wall reinforced rubber and COOLING FIN technology, both of which control heat, creating a comfortable ride comparable with POTENZA S001 (non RFT). — It delivers high dimensional dry and wet performance like POTENZA S001. — It is recommended for customers who demand Run-Flat Technology tires for a smoother ride. One of the best tire conferences around is Clemson’s Global Tire Industry Conference, held every April on Hilton Head in South Carolina. The conference organizers have created a new website for the event that includes downloads of the most recent papers. There is a wealth of valuable information available at the site, including papers on LANXESS’s solution SBR, Rhodia’s highly disperible silica, the status of the India tire industry, and several excellent overviews of the current regulatory situation in the United States. Here is an overview of the conference proceedings and here are the papers. On Monday, four major auto companies signed Memorandums of Understanding with the government of Tamil Nadu state to invest at least Rs 5,700 core (US$1.05 billion) and create some 9,530 jobs in the region. In addition, carbon black maker Phillips Carbon Black exchanged documents with the government for setting up a Rs 350 crore (US$64 million) carbon black plant in the SIPCOT Industrial Park at Thervoykandigai in Thiruvallur district. The plant will create 230 new jobs. The MoUs with Daimler India Commercial Vehicles, India Yamaha Motor, Ashok Leyland-Nissan Motor Company, Eicher Motors and Philips Carbon Black were signed in the presence of Chief Minister J Jayalalithaa. On Friday, Michelin announced that it plans to reduce tire output at a number of its European facilities in response to “very challenging market conditions deriving from reductions in tyre markets in the Euro zone, mainly in southern Europe, which have reduced dramatically since the start of the year.” The company added that stock levels were also negatively impacted by a very mild winter. One of the plants to be affected is in Dundee, Scotland, which produces passenger tires including smaller sizes that have been hardest hit by the weaker conditions. In response, Dundee will cease production for a three week period from the end of May until mid June. In addition, some of the planned holidays in July and August will be extended. The factory will use this time to accelerate certain progress actions and training programmes for its workforce. The Dundee plant, which is Scotland’s only tire plant, is celebrating its 40th anniversary in 2012, having begun production in 1972. Michelin said that jobs will not be affected but the current market conditions have led Michelin to slow its investment in the Dundee plant to better match the growth now foreseen in these markets. In the press release, Michelin also indicated that other of its European plants would see some additional downtime over the summer, but didn’t offer details on these plans.